Here is a selection of Spanish villas. This large family villa is located in the heart of Golf Valley, close to numerous golf courses and only a short drive to Puerto Banus. Built across three levels, the villa offers a large living room, dining room, fitted kitchen and guest room on the ground floor. The first floor offers four further bedrooms, two bathrooms and staircase leading to the rooftop terrace. The villa is surrounded by mature gardens with large palms, private pool and covered terrace area. Delightful family villa standing in a private, elevated position in Los Arqueros Golf off the Ronda Road. The south facing property is amongst the first built on the resort and offers open views, including partial golf- and sea views. Easy maintainable gardens with lovely pool area and BBQ. The property provides on garden level a reception room with high ceiling and gallery, a fitted kitchen with breakfast area, an ample lounge with open fireplace and dining area, one bedroom suite and a guest toilet. First floor comprise further three bedrooms, of which one is en-suite. Direct access to various terraces from three of the bedrooms, the kitchen and the lounge. Amongst fixtures and fittings are alarm system, double glazing windows and doors with security locks, A/C hot and cold, marble floors, fitted wardrobes, electric entry phone, etc. Also provided for is a full use basement with room for up to 16 cars!! The property comes fully furnished and is ready to move in an impeccable condition. Excellent option in a prestigious, sought after area. Built 380 sq. including a basement of 100 sq. Terraces 100 sq. Plot 1.100 sq. 4 bedrooms, 3 bathrooms, 1 guest toilet. This villa is located in Las Brisas, one of the best residential areas in Nueva Andalucia. There are facilities nearby such as the shopping center and bus stop however they do not comprise the tranquility of the area. This property features 5 bedrooms and 5 bathrooms (en-suite), entrance hall, dining/living room,bar, kitchen, wine cellar, parking for 5 cars, large basement with lots of options for building additional rooms, private pool, gardens with fruit trees, air-conditioning, BBQ, alarm system, satellite TV, safe box, service area totally independent and water tank. Everything is presented on one level. The situation allows for magnificent views of the mountain, and the property is also only one kilometer from the world famous Puerto Banus. Granada is only 150km away with its famous Alhambra & skiing in Sierra Nevada. 24 hrs Security System, 5-10 minutes to shops, ADSL, Air Conditioning Hot/Cold, Alarm System, Barbecue, Blinds, Built to High Standards, Completely Equipped Kitchen, Double Glazing, Electric Blinds, Electricity, En suite bathroom, Excellent Condition, Fitted Kitchen, Fruit Trees, Fully Furnished, Garden and Pool View, Laundry room, Living room with fireplace, Mountain View, Near Transport, One Level, Parking, Prestigious Area, Private Area, Private pool, Private Terrace, Quality Residence, Quiet Location, Safe Box, Satellite TV, Secluded Property, Sought After Area, Storeroom, Utility Room, Vegetable Garden, Very Good Access, Video entry system, Washing Machine, Well maintained community, Well presented, Wine Cellar. Detached family villa situated in an exclusive gated community in the heart of Golf Valley, Nueva Andalcia. 4/5 bedrooms and 4 bathrooms in immaculate condition with quality fixtures and fittings. Early inspection strongly recommended. This is a perfect family villa which benefits from having the majority of the living accommodation arranged on one level. 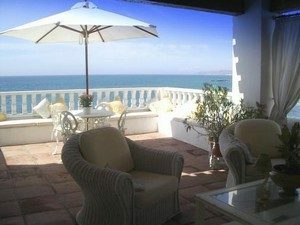 The house has a sunny southerly aspect with easily managed gardens, a private pool and mountain and partial sea views. The accommodation comprises an entrance hallway with vaulted ceiling, guest w.c. off. Large family lounge with open fireplace and access to the terraces, garden and pool. Split level dining room leading through to a well fitted kitchen with granite work-tops. Built-in appliances including a oven, microwave, hob, american style fridge/freezer and breakfast bar. Basement area with open playroom/tv room/ home cinema area, large utility room with washing machine and drier. Bedroom Nº 5 /service suite with en suite bathroom. Outside there is an extensive shaded terrace and landscaped garden with private pool. Hot and cold air conditioning, double glazing, under floor heating in the bathrooms. Quality marble flooring. 24 hrs Security System, Air Conditioning Hot/Cold, Built to High Standards, Close to all Amenities, Conveniently Situated for Golf, Conveniently Situated Schools, Detached Villa, Double Glazing, Exclusive Development, Fireplace, Fitted Kitchen, Fitted Wardrobes, Gated Complex, Ideal Family Home, Laundry room, Marble Floors, Private pool, Servants Qtrs , Underfloor Heating-bathrooms. Spacious detached Villa directly overlooking Mijas Golf. Lovely open views with a southerly aspect. Well proportioned and well appointed accommodation with central heating throughout. Heated swimming pool. This attractive Villa is situated in the exclusive Mijas Golf close to the Byblos Hotel and within easy reach of all local amenities. The house offers good sized family accommodation which briefly comprises and entrance hall with vaulted ceiling and feature staircase, lounge with open fireplace, family room and dining room (all open plan) giving access to a covered terrace leading to the garden. Kitchen with granite work tops, built in Neff oven and microwave, dishwasher and fridge/freezer. Utility room with washing machine and dryer. Guest bedroom with fitted wardrobes and bathroom with walk-in shower. On the first floor the Master bedroom suite incorporates fitted wardrobes plus dressing room with further wardrobes. Bathroom with walk in shower and large corner bath en suite. Access to a south facing terrace. Further 2 bedrooms (interconnecting) sharing a bathroom with walk-in shower. On the lower floor there is a very large garage/playroom. Well stocked gardens on two level with heated swimming pool. Open views over the golf course. Oil fired central heating with hot water radiators, electric under floor heating in the bathrooms, fitted window blinds, air conditioning. 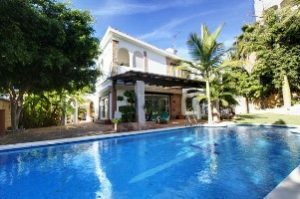 Detached Villa situated on the beach side of the Golden Mile within easy walking distance of all the amenities in Marbella including the beach. Enclosed garden plot in quiet location with large pool and guest cottage. Must be seen. This is a lovely property situated in a great position in one of the most desirable locations on the Costa del Sol. The villa offers very bright and spacious accommodation which briefly includes an entrance hallway leading through to an exceptionally large lounge with dining area with panoramic windows opening onto the garden and pool, the kitchen is completely open plan in the Scandinavian style and is fitted with modern units with high quality “Corian” work tops. There is a full range of appliances including Siemens oven, hob, microwave, dishwasher and fridge freezer plus a secondary fridge. Utility room with washing machine. On the ground floor there are two bedrooms one with en suite bathroom and the other with adjacent shower room. The master suite occupies the whole of the first floor and includes a large bedroom with sitting area and access to the terrace which enjoys a sunny southerly aspect. There is a large dressing room/study with extensive wardrobe space including a walk-in wardrobe. Modern en suite bathroom with huge walk-in shower. The separate guest house (ideal for teenagers) includes a sitting area with kitchenette, a bedroom and en suite shower room. The gardens are secluded and sheltered by mature trees and include a large swimming pool, extensive terraces including covered terraces with automatic blinds. Car port for 2 cars with drive-way parking for several cars. Extensive security system with cameras, hot and cold air conditioning, gas water heating and water softener. Blinds to the windows and automatic awnings. Air Conditioning Hot/Cold, Close to all Amenities, Detached Villa, Fitted Wardrobes, Garden and Pool View, Ideal Family Home, Laundry room, Prestige Fitted Kitchen, Prestigious Area, Private pool. A rare opportunity to acquire a stunning front line beach villa situated in Estepona. It has uninterrupted, panoramic views of Africa and Gibraltar from all of the many sunny terraces. The villa is set over three floors and comprises of four bedrooms, four bathrooms, all en-suite and a guest toilet. The house is rich in architectural design and features sloping ceilings and split level rooms, and an abundance of windows giving the property a light and spacious feel. 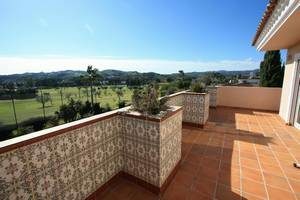 In addition, there are pretty Andalucian style courtyards, marble flooring throughout, a fitted kitchen, utility room, storage, separate dining room. On the lower level there are three en-suite bedrooms with the option of making a separate apartment, if required. Access to Beach, Beachfront, Community Garden, Community Pool, En suite bathroom, Fireplace, Full of Character, Interior Courtyard, Living room with fireplace, Marble Floors, Quality Residence, Storeroom, Sunny terraces, Tastefully Decorated, Utility Room, Walking Distance to Beach, Well maintained community. Character rustic style villa situated on the Golden Mile, Marbella. Secluded gardens and and comfortable family accommodation with many attractive features. 5 bedrooms and 5 bathrooms, all en suite. Gas central heating. Situated on the golden mile this charming villa is ideally located for easy access to all amenities. The accommodation is comfortable and well appointed with well proportioned rooms which briefly include and entrance hallway. Guest w.c., lounge with open fireplace, covered glazed terrace with access to the garden, family/tv lounge and separate dining room. Kitchen with marble work tops, built in oven, 4 ring gas hob, fridge freezer and dishwasher. 2 ground floor bedrooms with fitted wardrobes and bathrooms en suite. Master bedroom with sea views on the upper level with dressing area and en suite bathroom with bath and shower. Access to roof top solarium with panoramic sea views. 2 further his and her bedrooms with fitted wardrobes and en suite bathrooms on the lower level. Utility room with washing machine and drier. Mature gardens with swimming pool and sauna. Barbecue area, automatic irrigation. Driveway with automatic gates and car port. Plot 1591 m2 Built 331 m2. Air Conditioning Hot/Cold, Automatic Irrigation System, Charming Property, Close to all Amenities, Detached Villa, Fitted Kitchen, Fitted Wardrobes, Full of Character, Gas Central Heating, Gas Storage, Guest Cloakroom, Hot water by gas, Ideal Family Home, Living room with fireplace, Secluded Property, Separate Dining Room, Solarium, Swimming Pool, Walking Distance to Beach, Walking Distance to Rest. Brand new luxury independent Villa in a highly sought after residential location. Easy access to beaches, Cabopino marina and commercial centres at Elviria. A few minutes drive from the centre of Marbella. 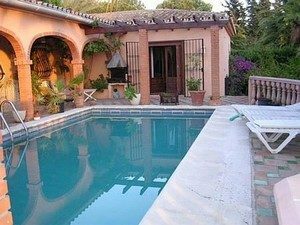 A very spacious family home built in the cortijo style with central Patio Andaluz with water feature and hand crafted mosaics by Granada Artizans, reminiscent of the Alahambra. This well appointed accommodation has a large vaulted entrance hall with imperious staircase and galleried landing. Lounge with open fireplace and access to an extensive covered terrace (also accessed from the kitchen). Dining room, guest w.c. and fabulous family kitchen, fitted with a full range of units, granite work tops and appliances including oven, hob, cooker hood, microwave, dishwasher, american style fridge, washing machine and tumble dryer, family sitting area with open fireplace. 2 Ground floor bedrooms, both with en suite bathroom and extensive fitted wardrobes, 2 further bedrooms including the master on the first floor with en bathroom with hydro-massage showers and extensive fitted wardrobes. The basement includes a further bedrooms with bathroom en suite and a further room suitable for a gymnasium of office. Super-large garage affording space for 8-10 cars. Landscaped tropical gardens, south facing, with extensive lawns, automatic irrigation. swimming pool with stone waterfall feature. Underfloor heating throughout (oil fired) Hot and cold air conditioning, double glazing. Intelligent house system etc. Air Conditioning Hot/Cold, Automatic Irrigation System, Completely Equipped Kitchen, Double Glazing, En suite, Fitted Wardrobes, Floor Heating, Gym, Ideal Family Home, Landscaped Gardens, Marble Floors, Patio Andaluz. Amazing contemporary villa in an established location with open golf and country views. 4 bedrooms and 4 bathrooms. Refurbished to an incredibly high standard with the best quality fixtures, fittings, decoration and security. This superb one level house has to be seen to be appreciated! This is one of the best contemporary styled villas we have seen on the coast. It has been comprehensively refurbished by the present owners for their own use and only emigration brings it to the market. Great care and attention has been made to the layout of the home and the fixtures and fittings throughout have been carefully chosen without attention to the cost. The property stands behind a high wall with automatic gates and affords a high degree of privacy. The accommodation comprises a gallery entrance hall running the full width of the building with guest w.c. off. The main room in the centre of the house is the kitchen, family room and dining room area which open directly out to the pool and sun terrace. The kitchen area is comprehensively fitted with high quality furniture including a very large central island unit with silstone work tops and 2 built in sinks. The appliances are by Miele and include 2 large ovens, warming drawers, steam oven, microwave and hob. Dishwasher and American style fridge freezer. Spacious and elegant lounge with open fireplace and direct access to the terraces and pool. Laundry room with extensive storage space and Miele washing machine and drier. Extensive covered terraces with living and sitting areas and automatic sun blinds. Stunning master bedroom with vaulted ceiling and large picture windows overlooking the gardens. Sitting area and his and hers dressing rooms with plenty of wardrobe and shelving space. Luxury en suite bathroom with roll top bath and large walk-in shower. The 2nd bedroom is also exceptionally large and includes a sitting area, access to the terrace and side garden. Large walk-in dressing room and en suite bathroom with slipper bath and walk-in shower. Bedroom Nº 3 also has a walk-in dressing room with en suite bathroom with slipper bath and walk in shower. The 4th bedroom although the smallest is still a very good sized double with fitted wardrobes and a delightful en suite bathroom with stylish slipper bath. Outside to the front of the property there is an extensive drive-way with parking space for several cars. The original garage has been covered for a guest suite or gymnasium and there is ample space for a further garage or car port etc. To the rear of the house there are landscaped gardens with a very large 3 level child friendly swimming pool. Barbecue house with built in drinks fridges and storage area. Oil fired central heating, hot and cold air conditioning, Lutron lighting systems and integrated music system with centralized storage. 24 hrs Security System, 5-10 minutes to Golf Course, 5-10 minutes to shops, Air Conditioning Hot/Cold, Automatic Irrigation System, Built to High Standards, Central Heating, Close to all Amenities, Conveniently Situated Schools, Detached Villa, Double Glazing, Fireplace, Ideal Family Home, Installed Music System, Intelligence System, Prestige Fitted Kitchen.